I visited Bill's Restaurant in Manchester for their 'Summer Of Music' event. During the summer, Bill's plays host to a number of outdoor gigs at all of their restaurants across the UK for customers to enjoy seasonal dishes and refreshing cocktails whilst listening to live music by an array of up and coming artists. I've always wanted to try Bill's, I love their new summer menu and there's so many choices to choose from that I felt spoilt for choice! This time round I decided to go for the crispy calamari starter, grilled halloumi salad with sweet potato fries as my main and the warm chocolate brownie dessert - it was delicious and left me feeling full which is a good sign. 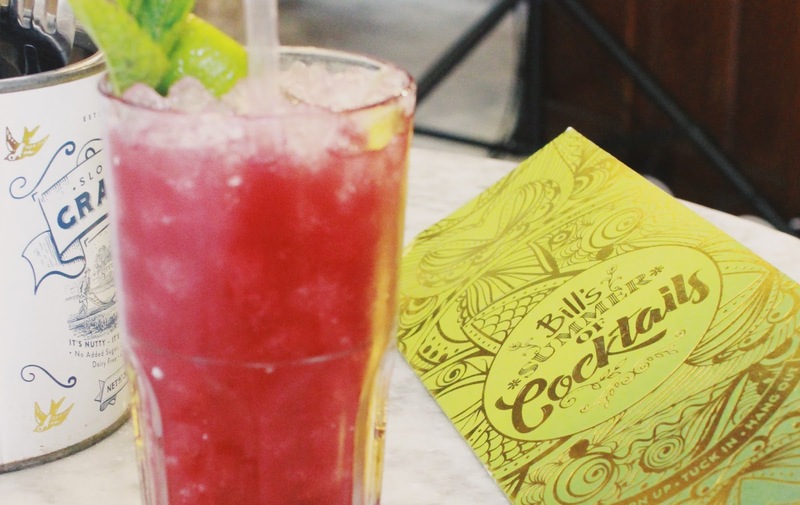 I also had the signature Bramble Mojito cocktail, their new cocktail menu also includes the Lemongrass Margarita with fresh chill and Bill's Signature Negroni. There is a lovely atmosphere in the restaurant, perfect for spending the evening with friends and listening to live music. Lucy Mayhew and Ollie Lloyd performed acoustically for us in Manchester, they were amazingly talented. The music events at Bill's will continue throughout Summer so you might be able to catch them in your area. You can reserve a table for the evening through the Bill's website here.